How Tempe Pedestrians Can Protect Themselves | Phoenix Personal Injury Law Blog - Breyer Law Offices, P.C. Tempe pedestrian accidents do not have to happen, and although many motorists tend to blame crashes on pedestrians, the truth is that drivers cause the majority of pedestrian accidents. That means that if you are a pedestrian, you should make every possible effort to keep yourself safe. And in order to do that you not only need to make sure that you follow the rules of the road, but that you also know how to identify unsafe motorists so that you can avoid them. Here are some of the easiest ways to identify poor drivers and get to a safer place. Watch out for motorists that don’t bother to make eye contact with you. 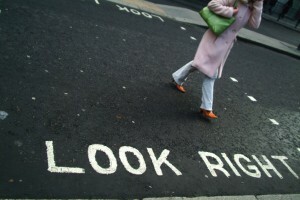 If you are crossing the street at a crosswalk, a light or a stop sign, it is important that you make eye contact with the motorists around you. If they don’t make eye contact with you, you have no guarantee that they saw you or that they will respect your right of way on the road. Pay attention to motorists who don’t slow down for corners and for lights. These motorists aren’t likely to pay attention to you crossing the street. They’ll turn the corner because their light is green, and probably won’t look out for pedestrians before doing so. Watch out for motorists who seem to be moving erratically on the road. If you notice motorists coming up alongside you that are moving erratically, try moving further away from the road if possible. This will help protect you should a motorist veer off the road. Pay attention to the speed of the roadway. Like begets like, and that is more than slightly true on the road. When one driver speeds or acts with a great deal of road rage, the others around them will follow suit. Watch for drivers who are behaving out of control on the road or not following the law, and you’ll find other unsafe drivers all around them. When you find yourself walking down the road it is important to always be ready for the reality that some motorists will not provide you with respect or care about your safety. Take your safety and your future into your own hands by learning to spot the drivers that are likely to cause you trouble. And if you do get into an accident, get in touch with a leading Tempe pedestrian injury attorney for legal guidance.